Indigenous campaigner calls for return of stolen shield from BP-sponsored British Museum – BP or not BP? Posted on June 19, 2017 July 3, 2017 by BP or not BP? Yesterday at 1.30pm, we accompanied Indigenous Australian campaigner Rodney Kelly into the British Museum. We took over part of the museum’s ‘Living and Dying’ gallery, and Rodney gave a series of five talks about his campaign calling for the return of his ancestor’s shield. Visitors to the museum gathered over the course of the afternoon to hear him speak and many completed feedback forms to the museum, expressing their support for his campaign. Rodney is calling for the return of an artefact from the museum’s collection, the Gweagal shield, which was violently taken by Captain Cook from Kelly’s great-great-great-great grandfather during the very first encounter between the British and the Indigenous peoples of Australia in 1770. Kelly also spoke about other stolen objects in the museum’s collection and called for their return, and explained why the oil company BP is such an inappropriate sponsor for the museum. This visit gave the public the rare opportunity to hear the story of an artefact from the perspective of the people from whom it was stolen. Members of our group played the role of “stewards” in an unofficial “Return the Shield” tour. We distributed 500 flyers to museum-goers, promoting the talks and the reasons why the Gweagal shield should be returned. Two performers dressed as robbers held a banner reading “Stolen Land, Stolen Culture, Stolen Climate”, referring to the colonisation of Australia, the theft of objects like the Gweagal shield and the climate change impact of the museum’s sponsor, BP. The Gweagal shield has an extraordinary story to tell. In 1770, Captain Cook arrived at Kamay (also known as Botany Bay), and encountered a group of the local Gweagal people, including a warrior called Cooman. Cook and his men opened fire on the people, and a bullet passed through Cooman’s shield and wounded him in the leg. The people were forced from the beach, and Cook and his men seized the shield (and other items). Cook later gave the shield to the British Museum. The shield therefore has huge significance for the Gweagal people and for Indigenous Australia as a whole, as the bullet hole in its surface tells a powerful and important story of the colonial violence of the first contact between the British and the Indigenous Australian people. Rodney Kelly is the 6th generation direct descendant of the shield’s original owner Cooman and is calling for its return on behalf of the Gweagal people. The Australian Senate has passed a motion supporting Rodney’s claim, and the community plan to fundraise for a special museum for the shield when it returns to Kamay. However, so far the British Museum have shown no sign that they are willing to return the artefact. In 2015, the British Musuem placed the shield in a BP-sponsored Indigeous Australia exhibition – but most of the communities whose objects were used, including Kelly and the Gweagal people, were not consulted about the choice of sponsor. 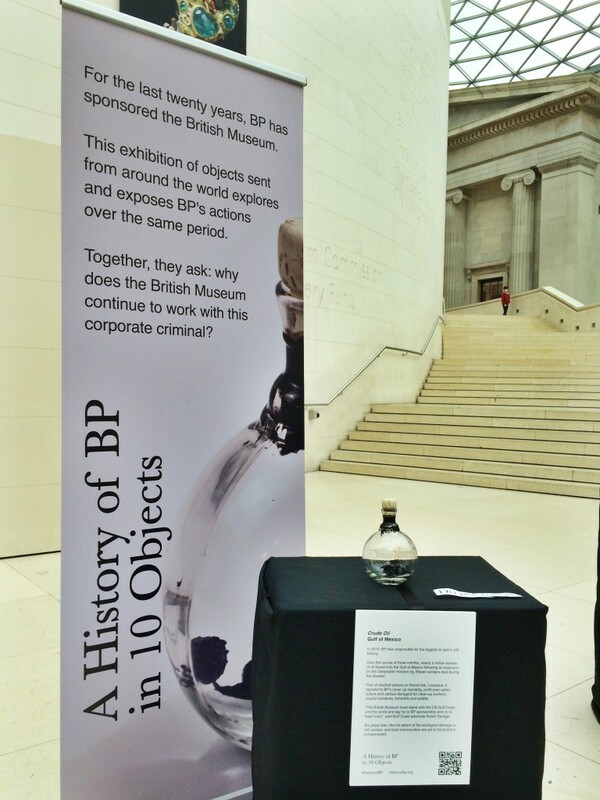 Last year, the British Museum signed a new five-year sponsorship deal with BP. In the museum yesterday, Kelly told visitors that he did not support the museum’s decision to partner with “one of the most polluting companies in the world”. The new BP deal effectively brands all the artefacts in the museum – including those taken from Indigenous peoples – with the logo of this destructive company. BP’s extractive activities and climate change are directly threatening the lives, lands and cultures of Indigenous peoples around the world (for example, BP funds lobby groups that support the Dakota Access Pipeline, and works with the occupying Indonesian government in West Papua). Rodney originally visited the museum in October 2016 and spoke with trustees, but since then communications from the museum have dried up. He believes they are not taking him or his request for the shield’s return seriously, especially as the museum have now sent the shield away for study without informing or consulting Rodney Kelly or his immediate family. Museum security did not prevent yesterday’s unofficial talks from going ahead, and we left the museum freely at 5pm.